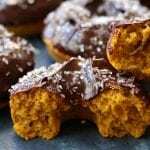 A baked buttermilk donut with the flavors of Fall and cinnamon spiked ganache. Bring butter, buttermilk and cream to room temperature. Preheat oven to 350℉ and spray 2 donut pans containing 6 holes with nonstick cooking spray. In a large mixing bowl sift together flour, baking powder, salt and spices. Stir in flax and wheat germ, mix well to fully incorporate. In a stand mixer cream together butter and sugar for a full 5 minutes, scraping down sides a few times. Whisk in pumpkin, eggs, buttermilk and vanilla. Incorporate dry ingredients into wet until fully incorporated making sure to not over mix. Spoon batter into pastry bag or gallon sized ziplock bag. Cut tip off of bag and squeeze batter into donut holes filling almost to the top (a little more then 3/4 full). Bake in a preheated 350℉ oven for 14-18 mins or until donut springs back to the tough. Be careful to not over bake. Let cool in pan for 5 mins and then out of pan on a cooling rack until fully cool before dipping into ganache. Stir cinnamon into heavy cream. Melt chocolate in the top of double broiler over low heat and about 1 inch of water in the bottom of the pan. Once chocolate is almost melted stir in half of cream until incorporated. Add in last of cream and continue stirring until fully incorporated. Let ganache cool for about 5 mins before dipping. Once donuts are cooled carefully submerge top of donut into ganache. Repeat with all donuts. Sprinkle with nuts, chocolate shavings or coarse sugar.